Fitness DVDs are all the rage in January, as people try to stick to their resolutions and get fit. 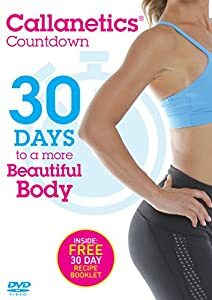 I too have the same resolutions, and tried the Callanetics Countdown: 30 Days To A More Beautiful Body. I also have a little giveaway of a copy for you guys to start the New Year, so read on to find out more. The DVD is structured into 3 levels according to the days you're working out: days 1-5 is Level 1, the easiest workout (or one that shouldn't be particularly complicated), days 6-15 is Level 2 and finally Level 3 is days 15-30, so quite a big jump but is the most advanced workout and requires more strength which you shall build up whilst doing this DVD. Personally for me I definitely felt a difference from day to day, as each exercise became easier and I could move on to the next level, feeling more strengthened and toned. I couldn't do some of the exercises as I have a bad knee, but I did the one before twice instead. The instructors aren't patronising at all and show all the ways of performing the moves from beginner to advanced. It's not an in-your-face DVD either as some fitness videos can be and that's because Callanetics is about using small motions to tone the body, with different positions and apparatus to use. It's a great DVD and if you're looking for something that isn't all about push-ups and squats, this is definitely a great option. I love it so much that I'm giving a copy away to one of you lucky readers. To enter the competition you have to retweet this tweet and follow me on Twitter to be entered and the winner will be picked next Wednesday (25th January). Good luck!